We all owe our lives to someone, starting with mother and father and then outward along a spreading tree of life going back in time. For those who make a living in the academic realm, a second tree of life is entwined with the first: a branching series of mentors and intellectual influences. “We are the sum of whoever we worked with,” said developmental psychologist Howard Gardner, a celebrated, wide-ranging scholar based at the Harvard Graduate School of Education (HGSE). For him, that sum includes a few names everyone knows. Erik Erikson and David Riesman were both at Harvard when Gardner was an undergraduate. Jean Piaget and Claude Levi-Strauss corresponded with the young scholar before he earned his Harvard Ph.D. in 1971. (The two men were soon the subjects of his first trade book.) 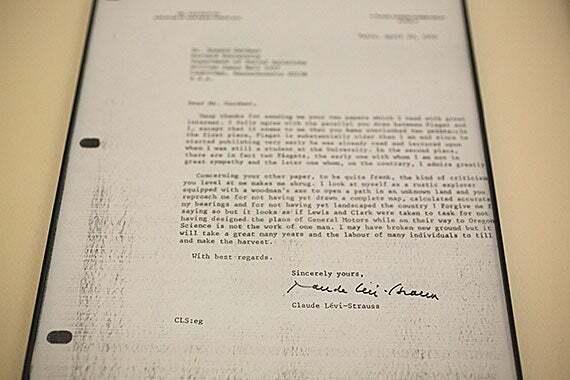 In 1970, by chance, each of these iconic revolutionaries in the realm of ideas — one a theorist of cognition and the other an anthropologist — wrote letters to Gardner on the same day, April 10. 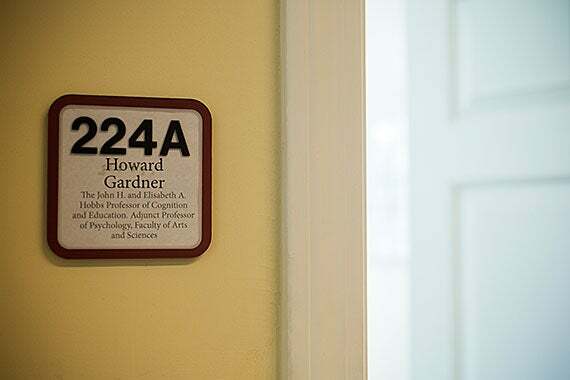 Gardner, who himself is now a longtime important influence on two generations of students, keeps an office in Longfellow Hall. 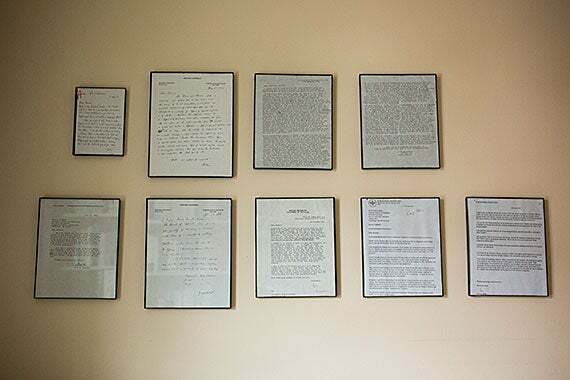 In lieu of diplomas and awards, Gardner lines his office walls with memorable letters and other reminders of his mentors and academic friends. 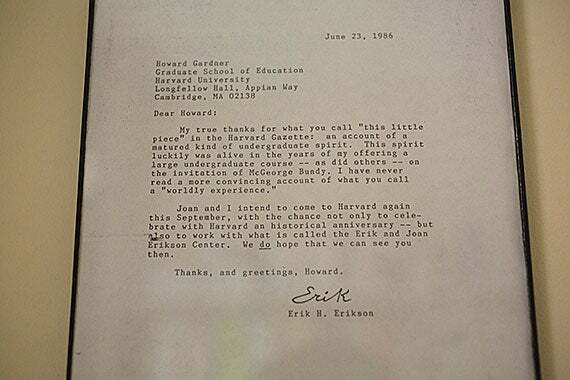 One framed letter is from Erik Erikson, a legendary developmental psychologist who was Gardner’s tutor at Harvard College. 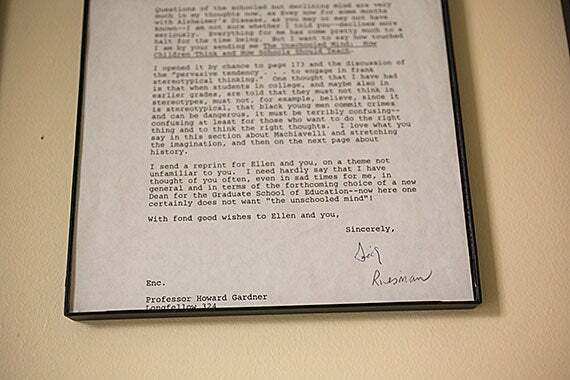 Another framed letter is from celebrated sociologist David Riesman, author of “The Lonely Crowd” and an important Harvard influence. A letter from anthropologist Claude Levi-Strauss, who corresponded (and argued) with Gardner for decades. Gardner framed a copy of his 1976 review of a book by Piaget, whose picture captures the older scholar’s Gallic charm. In a typical day, that might mean writing a half dozen letters, along with emails — a time-eater of enormous proportions, he said. Not everything in Gardner’s office has such apparent import. Decorations include a toy VW (yellow), a carving of an outrigger canoe, five labeled chairs (one says “High Priority”), a candy dish decorated with sea horses, an alarm clock, and a quill pen. The last two items, perhaps, underscore Gardner’s still-fervent scholar’s life after 52 years at Harvard. The clock is still ticking on what is left to do (he turned 70 in July), and much of that involves writing. Such relationships have enriched his life for decades. “Howard,” he remembered a friend saying, “you have a talent for attracting mentors.” Their number and variety is evident in “Howard Gardner Under Fire” (2006), a book of essays critiquing his work. (“It was undertaken with my blessing,” he said of the volume, which includes responses to each of his critics.) It opens with “A Blessing of Influences,” an essay on those who positively impacted his life. It is 30 pages long. Pressed for time, Gardner supplied the highpoints of his mentored life, beginning with the comfort of his upbringing in Scranton, Pa. His Jewish parents — sensitive and cultured, though without university educations — had fled Nazi Germany in 1938. Around them gathered like-minded exiles in that Pennsylvania coal-mining town, an early simulacrum of the largely Jewish and European scholars who would later influence Gardner’s flowering life of the mind. “Intellectually,” he said of one of them, “Piaget was probably the single biggest influence in my life.” He came to know the burly Swiss psychologist and philosopher, even though Gardner’s French was as limited as Piaget’s halting English. (In person, they used an interpreter.) 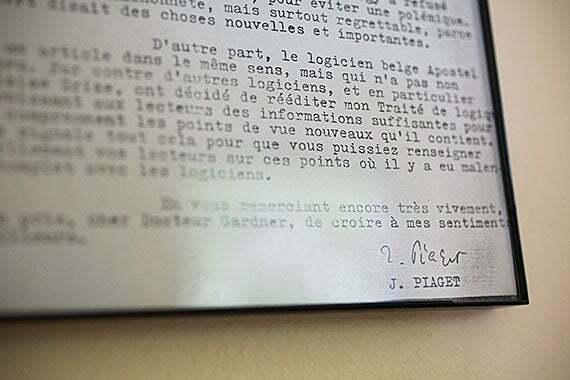 In his office, Gardner has a framed blowup of a 1975 review of a Piaget book he wrote for The New York Times. Until the elder psychologist’s death in 1980, it was a sign of his influence, Gardner said, that he spent decades trying to prove Piaget wrong. In personal terms, other mentors came into Gardner’s life earlier and more directly, starting at Harvard College in the fall of 1961. Erikson, a polymathic explorer of ideas and inventor of the term “identity crisis,” taught in what was then the Social Relations concentration. (Gardner still laments the passing of this short-lived amalgam of psychology, sociology, and anthropology.) “He was intellectually charismatic,” said Gardner of his junior- and senior-year tutor. The men who influenced him early on were not only largely Jewish and of European origin, they were intellectuals who took a lot of interdisciplinary turns in their own young lives. “Many of my mentors had unusual paths,” said Gardner, who to this day espouses the richness of seeing a problem through the lens of many disciplines. Erikson never went to college; was a painter who held that “an artist is a person of some talent with no place to go”; and taught in a primary school in Vienna run by Anna Freud, daughter of Sigmund Freud. It was an unusual occupation for a man, but a formative one for a scholar who would spend his life investigating psychological development in children. Riesman was also at Harvard during Gardner’s undergraduate years. He was another restless polymath, who in this case turned from a brilliant law career to sociology, in which he had no formal training. His co-authored 1950 study of postwar American conformity, “The Lonely Crowd,” remains a classic. 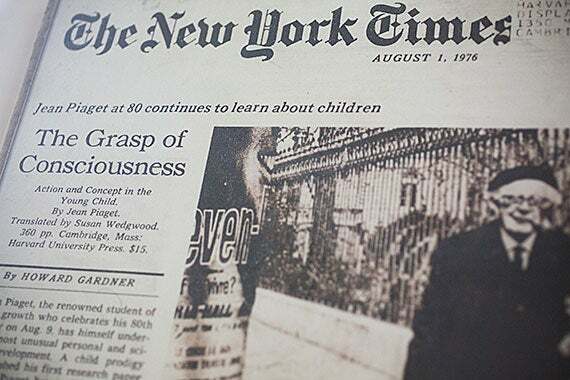 In the summer of 1965, as a new graduate of Harvard College, Gardner met Jerome Bruner, “the most famous psychologist of the ’60s and ’70s,” he said, and a pioneer of cognitive psychology, which studies how people actually think, remember, and learn. Bruner also had a deep interest in how children learn, setting off in the young Gardner a lifelong interest in pre-collegiate education. More than that, Bruner ran his research groups in a nonconfrontational, collaborative way that Gardner took to heart in his own life. “He is the person who has had the most influence both on what I do, and how I do it,” he said. Like Gardner’s other mentors, Bruner used more than one discipline as a lens for learning. At age 70, he started teaching at the New York University School of Law — and still does, at age 98. Geschwind is the author of another letter on Gardner’s office wall, one that was part of their dialogue on where visual, auditory, and spatial perception reside in the human brain. His late friend helped establish the links between brain and mind, in part by taking another step that Gardner admires: acknowledging the past. Geschwind rediscovered the work of 19th century German and French proto-neurologists. “This whole source of knowledge was forgotten,” said Gardner, lost in the United States because of enmities stirred up during the World Wars. The last of Gardner’s main early influences was not a public intellectual in the way Piaget, Erikson, or Riesman were. Still, Nelson Goodman “was already one of the most esteemed philosophers in the English-speaking world,” Gardner wrote recently in a personal history of Harvard’s Project Zero. Gardner was a second-semester graduate student at Harvard in 1967 when he joined Goodman in founding the project, an HGSE research group intended to study how children, adults, and organizations learn. Gardner’s recently authored history was “bus writing,” he said — that is, something to have in place in case he got hit by a bus. As a philosopher, Goodman was interested in the nature of knowledge. He was also a student of the arts, was married to a painter, once managed a Boston art gallery, and so was drawn to founding Project Zero as a way of investigating artistic knowledge and creativity. These were interests that became central to Gardner’s own work. “Nelson had a lot of intellectual influence on me,” he said. Goodman ’28 also had classical ideas about clarity, and would say that he stopped reading something when it no longer made sense. Gardner took Goodman’s lesson to heart: “I’m a demon for clear writing, in myself and others,” he said. So many influences, and so much work still to do. Gardner jokes that despite all the turns his work has taken and all the disciplines it has tapped for insight, the short version of his obituary will still likely say, “Father of multiple intelligences.” His groundbreaking “Frames of Mind” appeared in 1983, and Gardner fanned the flames of the discussion for years, though he has since “moved on,” he said. As for actually moving on, as in retiring: Gardner considered it five years ago, when he turned 65. But his family rose up “vociferously” against the idea, he said. One of an occasional story on senior Harvard faculty members who recall the mentoring influences that helped to shape their academic lives. Professor Joshua Greene spoke during a recent academic integrity panel as professors Stephanie Sandler (from left), Rakesh Khurana, interim Dean of Harvard College Donald Pfister, and Dean of Undergraduate Education Jay M. Harris listened.